Faradji taking a wide points decision and the WBF belt back in July of last year. Since then Faradji had vacated the title, which had been won been Matlosci in the meantime. The action begins and a feeling out round is on offer for the first three minutes with little action happening. In the second, Faradji seems arrogant and almost Junior Witter-like as his hand are low and he flicks out the jab with good success. Suddenly...Bang! He catches Matlosci with a crunching uppercut/left hook that has the Hungarian down for the eight count and wincing in pain. Wild hooks from Matlosci start the third and some good exchanges happen. Faradji looks the stronger and lands good left hooks again followed by an awesome overhand right that brings out the Ali-style shuffle from his nimble feet. The highlight of the fourth is a good left uppercut from the Frenchman followed by some solid combinations that seem to force Matlosci to land a very low blow. Matlosci comes out swinging wildly in the fifth and catches Faradji, who looks shaken. Things are hotting up as the Hungarian lands a succession of hooks and body shots, answered swiftly by Faradji, who lands a wicked left/right hook combination that has his opponent getting another eight count. Faradji knows he can take him now but remarkably fails to go for the kill and sits off his man. The sixth sees a good left hook from Matlosci followed by some hard body shots that seem to wobble the arrogant Frenchman on two occasions. Faradji switches to southpaw and lands some hard right jabs The seventh is notable for a hard exchange as both fighters tear into each other in centre ring, producing an even round. The eighth sees Faradji switching again and the challenger bamboozles Matlosci with some great wide punches, all shot from the hip. A slow one follows here in the ninth with both men taking a breather. With his face now visibly marked up, in the tenth, Matlosci lands some big left and right hooks that force Faradji to switch stances again before he lands some good uppercuts. 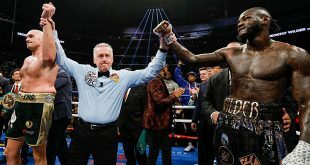 Knowing that he needs the knockout, Matlosci starts to up the pace in the eleventh and lands two hard left hooks which bring out some fierce inside exchanges. The twelfth finds both fighters tear into each other and the Frenchman wins the exchange while Matlosci is cut above his left eye. Brice Faradji finishes the stronger, claiming the WBF Light Middleweight belt once again on a unanimous points win and moving to 20-8 (7). Joszef Matlosci drops to 22-9 (15). 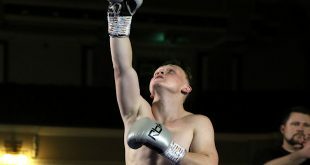 Another bout on the bill was a scheduled eight round cruiserweight contest between the super durable centurion Paul Bonson of Featherstone, England versus Hungary's Gyorgy Hidvegi, who had already posted a win over Bonson in September of last year. Its a slow start to this bout as the two men feel each other out and little action ensues. The second sees things start to open up with a good overhand right by Hidvegi, who starts to come strong. Bonson comes back with a cracking uppercut and his own huge overhand right. Hidvegi looks the stronger man as the bell sounds. A good left hook to start the third round from Hidvegi, who starts to now jab well and causes the blood to flow from Bonson's nose as the Englishman seems to be simply walking straight into the left hook time and time again. I have the Hungarian well ahead already by the fourth as he starts to boss this bout and lands some hard blows. Bonson's nose again leaks claret and the veteran is slowing now but looks tough with it as some hard left hooks fire in from Hidvegi. Some solid head and body shots from the big Hungarian land in the fifth before both fighters start to fade with Bonson looking flat footed and sluggish. Good chopping right hand from Hidvegi as a scrappy sixth round unfolds and Bonson receives a verbal warning from the ref. Bonson seems content to hold in the seventh as Hidvegi lands some brutal hooks and uppercuts. Both men end the round holding. Bonson senses he's behind in the final round and starts swinging wildly as the Hungarian comes back with three hard hooks to the head. As the bell sounds a draw is declared to my disbelief and many of those at ringside as well. In short, a disgraceful decision that leaves the Hungarian spitting out his gumshield in disgust. Believe me, he won this fight by five rounds with ease. After the draw, Gyorgy Hidvegi's record stands at 9-1-1 (6) while Paul Bonson falls to 19-85-7 (1). A scheduled six round featherweight contest saw Paul Hyland of Dublin taking on Polish fighter Dariusz Snarski, a frequent visitor to the UK. Hyland looks sharp in the opener and lands a good right cross to the head of the seemingly more aggressive Pole. Hyland looks the business in the second as he fires in some snappy jabs and varied hooks but walks into a thumping punch that leaves his nose bloody. Good inside work from Snarski in the third but Hyland is the cuter of the two and slips away to fire in some telling straight punches as all at ringside agree that he has some great skills. Hyland walks into a crunching right hook during the fourth and looks wobbled for a moment before regaining his composure and forcing his man back with a nice selection of punches that bring a slip from the back stepping Polish man. A quiet fifth frame follows as both men take a breather. Some holding goes on but little else happens. A tough exchange to start the sixth with as Snarski appearing the stronger man, landing some thumping hooks. Hyland returns fire with a vicious left hook. Snarski sends it back with a brutal double right hook that clearly has the Irish lad wobbling to end the contest. The verdict is in and Hyland wins by unanimous decision, improving to 7-0 (3). Again, many ringsiders disagree and I had the Pole Dariusz Snarski, 16-22-1 (3), ahead by two clear rounds. In a welterweight contest, Canning Town's George Hillyard met Gary Harrison of Brighton. In the first, hard hitting Hillyard shows that he is definitely one to watch with crippling body shots delivered mercilessly to Harrison in the opener. The second has Harrison fully aware that Hillyard has tremendous power to the body and the South Coast man plays into the Londoner's hands and stays on the ropes as punch after punch fly into Harrison's body and are already marking up his midsection, leaving him looking sunburned. In the third, Hillyard pounds away at the Brighton man and the fist attack continues with the Canning Towner bashing his rival around the ring at will. Hillyard really has fierce power in either hand and Harrison seems to be losing interest. the round closes as Hillyard lands a cruel low blow that has his opponent wincing in pain. Hillyard turns it on in the fourth and unloads some brutal punches that end with a chopping right hook, leaving Harrison sprawling on the canvas for an eight count. By the fifth, Harrison has had enough and seems to be suffering an injury to his arm, unable to continue. George Hillyard gets the stoppage win, moving to 4-1 (3), and looks a very dangerous and hard hitting prospect. Gary Harrison drops to 4-7 (0). 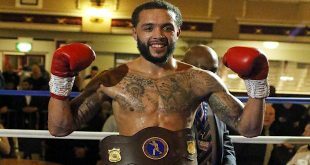 The Michael Lomax vs. Elio Vac Anglarill fight is called off due to the Bolivian failing a brain scan which left us with only a handful of bouts. 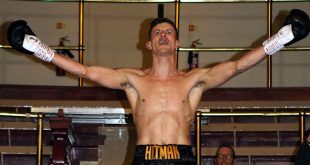 Ex-WBF Light Welter titlist Ted Bami stopped Maurycy Gojko in four rounds with some brutal punching that had the Polish man knocked out for the first time in his nineteen fight career. Bami sees his record to 22-2 (11) while Gojko heads down to 13-5-1 (5). Also, former Commonwealth, IBO and WBF Light Middleweight Champion Richard Williams, 20-3-1 (16), soundly beat yet another Pole, Marcin Piatkowski, 18-5-2 (5), on points in a pretty tame six rounder. Lightweight Jed Syger of London remained unbeaten at 7-0 (2) by seeing off Ukrainian veteran campaigner Rakhim Mingaleev, 27-46-1 (8), over six rounds. Two other fights were unfortunately called off, both featuring the other two of the three Hyland brothers.